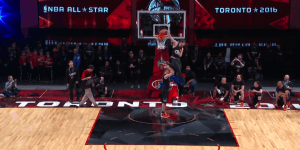 What's the Best Vertical Jump Training Program in 2019? 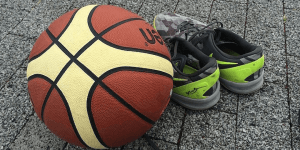 Which vertical jump training program am I going to do? What is going to deliver the best results for me? In this article, I will tell you why I decided to do Vert Shock instead of the J﻿﻿u﻿﻿mp Manual. Going with Vert Shock turned out to be a great decision as I increased my vertical jump by 8 inches and became a consistent dunker for the first time in my life. Make sure to check out the video below to see my transformation! Vert Shock and Jump Manual are by far the two most popular programs of vertical jump training. And there is a reason for that! Both programs have been proven to work and will increase your vertical jump significantly. Unlike older, purely marketing-driven programs like Air Alert or the Jumpsoles, these programs are backed by scientific findings and years of vertical jump training experience! However, there are certain athletes that will have better results using Vert Shock and others will make better improvements using the Jump Manual. My goal is to provide you with all the information you need to find out which type of athlete you are and to decide which of the two workouts is better suited for you. As I have already talked about Vert Shock in great detail in this post, I am going to focus more on the Jump Manual. The Jump Manual﻿ was created in 2008 by Jacob Hiller. 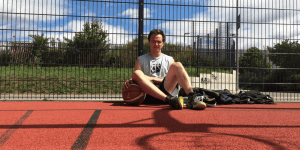 It originated as a series of YouTube videos where Jacob talked about what he learned after trying every conceivable vertical jump workout like Air alert, stair running or ankle weights. 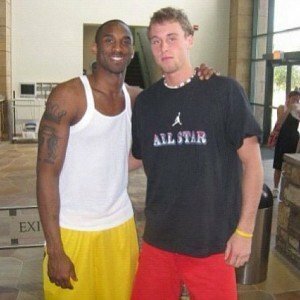 These videos turned out to be so popular that he soon created his own vertical jump program and started selling it online. Since then he was featured on ESPN, Sports Illustrated and Men's Health and sold over 100.000 copies of his program. 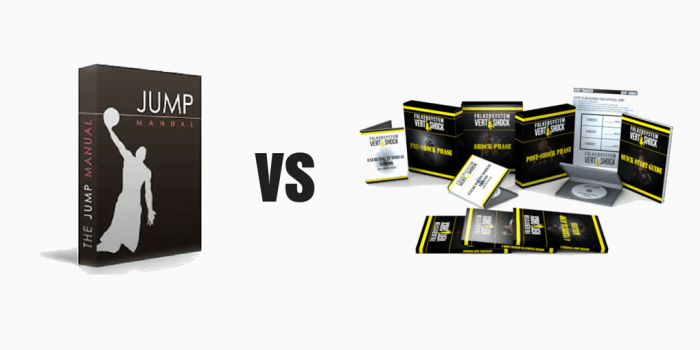 Over the past 8 years, the Jump Manual has gathered lots of happy customers that prove that the program really works and developed into the most popular vertical jump training online. You can see some of the most impressive transformations here. But in 2014, a serious challenger emerged: Vert Shock, the program created by Adam Folker in cooperation with Justin 'Jus Fly' Darlington. 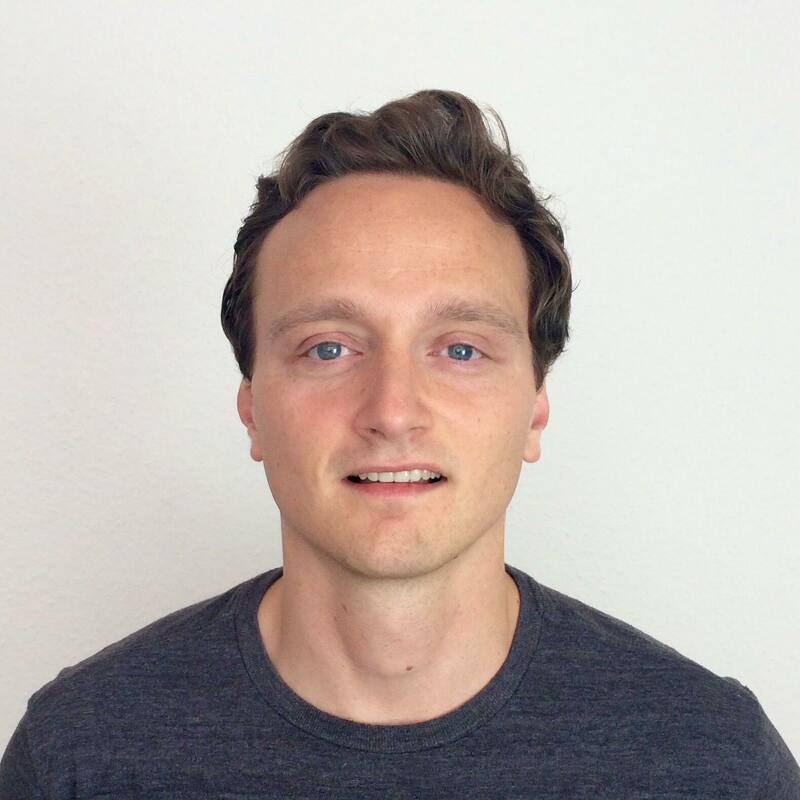 Adam is a former Division I basketball player from the University of California Irvine and a Certified Strength and Conditioning Specialist. 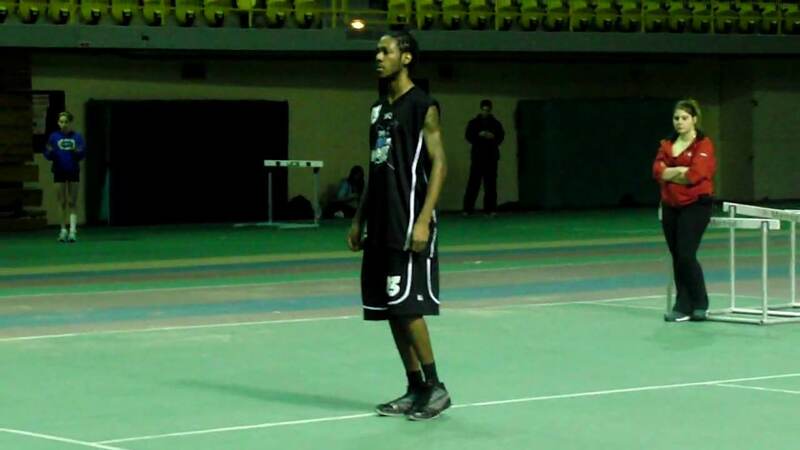 Today he is a professional basketball player because of his relentless work ethic and his "Never Quit" attitude. 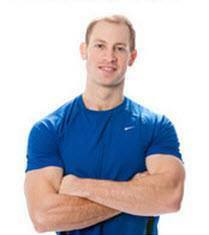 Based on hard science, years of undeniable proof and sound training principles, Adam developed a workout plan that took the internet by storm and soon became the #1 vertical jump program available online. Check out some amazing transformation stories here. But which program is actually better? Let the battle begin! 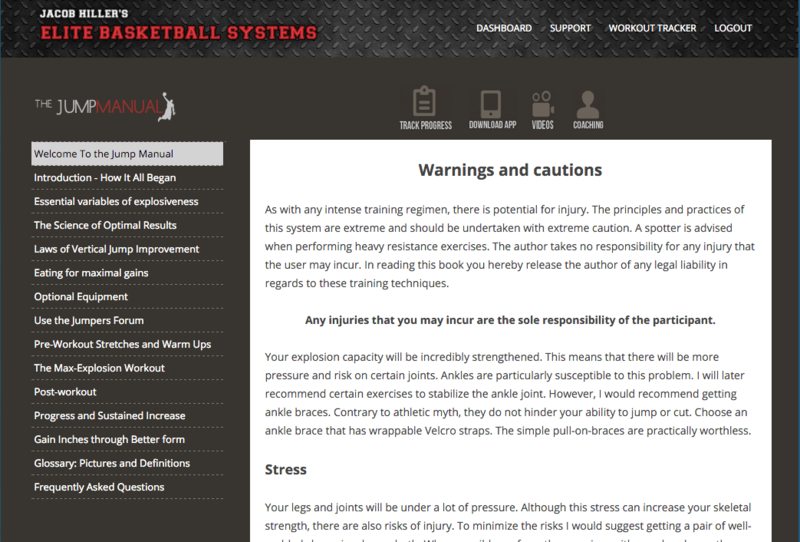 The homepage of the Jump Manual program greets you with an almost intimidating amount of information. The layout of the website is organized like a book. On the left sidebar, you can see a table of content listing the 15 chapters included in Jump Manual. These chapters cover different topics like the scientific background of the program, optimal nutrition, perfect jumping form etc. Whereas Vert Shock heavily focuses on short and concise videos to tell you everything you need to know, Jump Manual requires you to read through a lot of pages explaining the program in great detail. I personally like the fact that the Jump Manual really dives into the world of vertical jumping and gives you a lot of information. However, the presentation of the program is no longer cutting edge and could be much more user-friendly. You can definitely tell that the Jump Manual was developed in 2008 before the advent of WEB 2.0. The advanced age of the Jump Manual shows most noticeably in the very low video quality. Most of the chapters are accompanied by little clips of Jacob Hiller talking into a webcam. These videos might very well be 10 years old and don't look professional at all. Nowadays, every cheap cellphone can record videos that look a LOT better. 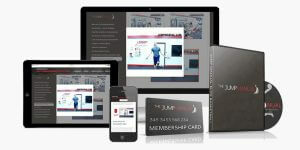 Vert Shock's membership section is much cleaner designed, more user-friendly and the videos are of much higher quality. The workouts of the Jump Manual are called "max exploson workouts" and are designed as a 2-week circle. This means that after completing day 1 - 14 you start from the beginning with day 1. The program is laid out to last for 3 months, however, because of this circular nature you can basically do it endlessly. The workout plan is rather complicated, but to put it simply there are four different types of workout. Workout 1: This day focuses on explosiveness. Plyometric exercises combined with jumping related movements with added resistance like weighted explosions or medicine ball throws. Compared to Vert Shock there are a few overlapping exercises but overall the focus is more on weighted exercises and less on pure explosiveness. Workout 2: This workout is called the core series. It consists of different exercises that strengthen your core which is necessary to increase stability and avoid back injuries when jumping. Workout 3: This workout consists of heavy work in the Gym. Squats, deadlifts and other exercises are working on the strength of your lower body and back. Workout 4: This is called "off day exercises". Relatively light jumping exercises which are not supposed to be very exhausting. Workout types 1,3 and 4 are done once a week and the core series (workout 2) is performed on two days, so overall you are working out on 5 days a week. Additionally, you are required to stretch your entire body on off-days. So how do the workouts of both programs compare? Round 2: How time-consuming are the workouts? The most noticeable difference in this regard is that Vert Shock lasts for only 8 weeks compared to 12 weeks for the Jump Manual. The number of weekly exercises is comparable as both programs average about 5 workouts per week. However, the average individual Jump Manual workout will take you a lot longer than the average Vert Shock workout. Especially the day in the Gym with 7 exercises, warm up and cooldown would take me personally about 2 hours. Vert Shock is a lot less time-intensive as most workouts are easily done in 45 minutes. Vert Shock is four weeks shorter and the individual workouts are less time-intensive. This is where the Jump Manual and Vert Shock really differ. 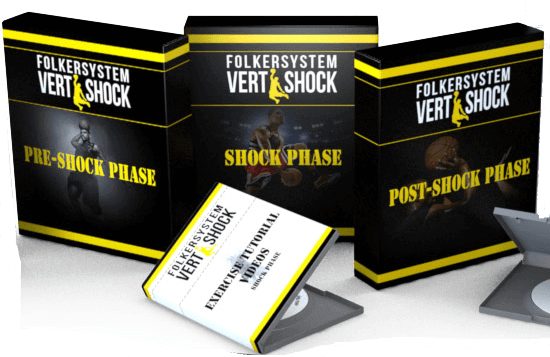 Vert Shock heavily focuses on jumping-related exercises and advanced plyometrics. These movements are all performed without added weights and are therefore easy to learn, safe and can be done anywhere. Some exercises featured in the Jump Manual are much more difficult to perform. 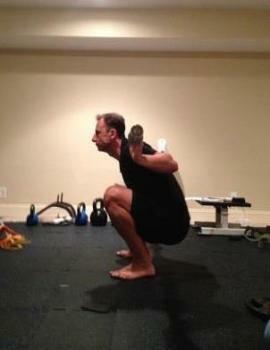 Squats and Deadlifts for example move a lot of weight and should be taught by a good instructor. These are easily done wrong and can do a lot of harm to your body. On top of that, there are two exercises which are influenced by olympic weightlifting. These are not only done with heavy barbells but also in a very explosive manner. Exercises like these are really not meant for beginners and should be taught by educated trainers and not by low-res video clips. Of course, if you are already a well-trained weightlifter or you have access to a gym with good coaches this does not pose a problem for you. Don't ever squat like that! The workouts of Vert Shock are much easier to learn and a lot safer because they are done without added weight. The pricing of both programs is exactly the same. You can get Vert Shock for $67 here, and the Jump Manual for the same price here. These programs used to be more expensive, but I guess that competition is good for us customers! Both programs also offer a generous money back guarantee, so if you are not seeing results you can request a refund within 60 days, no strings attached! Final Round: Which program delivers the better results? 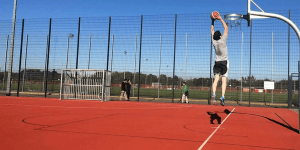 So, what is the best vertical jump training for me? And the answer is pretty easy: It depends! While both programs have the same goal of increasing your vertical jump, they actually go at it from slightly different angles. There are many different factors like strength, quickness, form, flexibility and many more that determine an athlete's ability to jump high. Both programs train all these factors to varying degrees. 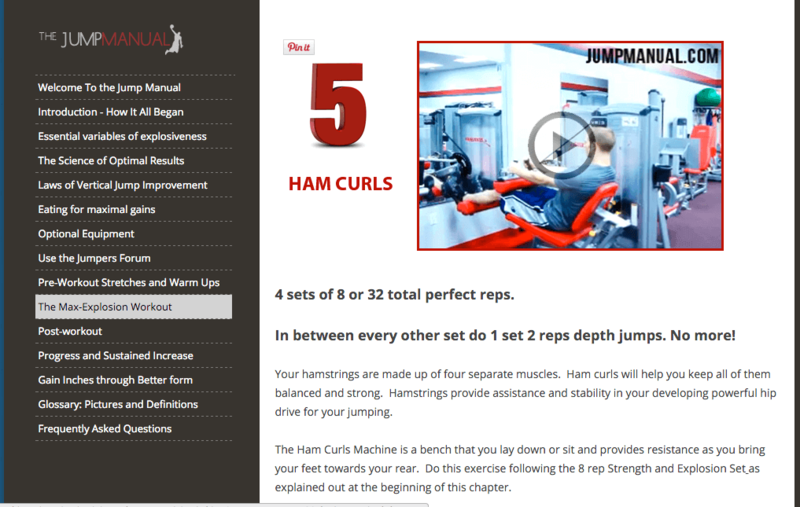 Jump Manual focuses mostly on force by including classic strength exercises like the Squat and the Deadlift. Vert Shock focuses more on speed by featuring lots of advanced plyometric exercises. Obviously, Jacob Hiller has spent a LOT of time in the Gym and really maxed out his capacity for strength. Justin Darlington, winner of the Nike World Basketball Festival Dunk Contest, has a 50" vertical jump just because he is insanely quick. The fact that Vert Shock focuses on speed is one reason why it only lasts 8 weeks and delivers faster results. It is a lot easier to significantly improve your quickness compared to your strength. Assuming you are completely untrained, it is possible to increase your vertical jump by 5 inches in a matter of weeks or even days by just focusing on your quickness. The same would take much longer if you were just working on your strength. You will not look like Jacob Hiller in the picture above after just working on your strength for three months, this takes years! Working on your quickness has the added benefit that it doesn't require gym equipment and can be done by everybody. I would recommend 90% of athletes to do Vert Shock instead of the Jump Manual because it will deliver better and faster results. However there are ​certain athletes who might see better results using the Jump Manual. - When you're already a bit older (maybe > 35 years) and you feel like your capability for speed is not what it used to be. The ability to improve speed decreases with age, therefore, it might be more effective to do the Jump Manual and focus on your strength. - You are a "Force" Jumper. This means that you are naturally jumping off of two feet and you are bending your knees very deep during jumps. These jumpers are often really muscular and gain very little height off the run compared to jumps from a standstill. This style of jumping is relatively slow and does not benefit as much by improving speed. Learn more about the different jump techniques here. - You have had problems with your knees or other joints before. Depth jumps and other plyometric exercises can be hard on your joints.Therefore, Vert Shock might be problematic. Doing Jump Manual has the added benefit that stronger legs also deliver more stability and might prevent future injuries. For most people Vert Shock is the program of choice. I did it myself and increased my vertical jump by an awesome 8 inches (read all about it here). It is easier to do, 4 weeks shorter and will deliver better results for the majority of athletes. 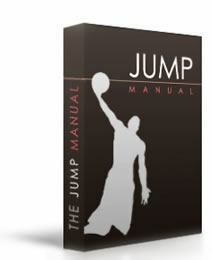 However, there is a minority of athletes that will respond better to the workouts of the Jump Manual. Every exercise is explained in great instruction videos, the printable PDF workout sheets are easy to read and no gym is needed! The web page could be more user-friendly and the quality of a lot of videos is really poor. However the program is packed with valuable information. Exercises are demanding but always manageable. No weightlifting or gym membership required. Difficult weightlifting exercises included which are not beginner friendly. Prior experience or a good ﻿﻿coach﻿﻿ required. You can buy the program for $67 here, which is not cheap. But finally being able to dunk is definitely ﻿﻿﻿worth﻿﻿﻿ it! The Jump Manual sells for $67 h﻿﻿ere. Both programs also offer a ﻿﻿60﻿﻿ day money back guarantee. I have tested it myself and increased my vertical by 8 inches in ﻿﻿﻿only﻿﻿﻿ 8 weeks. I now have a 37" vertical and can dunk easily with two hands! I have never done a complete cycle of Jump Manual, but there are a lot of success stories on the ﻿﻿﻿internet﻿﻿﻿. The Jump Manual definitely works! Jump Manual was developed in 2008 and it shows. It is no longer cutting edge, but it still works! You think about doing Vert Shock? Then I have written the perfect guide for you! In this guide, I explain everything I have learned and tell you exactly what you can expect from the training. There is even an interactive calculator that tells you how much Vert Shock could increase YOUR vertical jump and if you will be able to dunk after 8 weeks of training! How to get the best of both worlds! Want to go really crazy and get every last inch out of your vertical jump? At the beginning of the offseason start a weightlifting regime. There are many good ones, but this can be very simple. For example, you could squat, deadlift and bench press 2 times a week. This way you will lay a really decent foundation by improving your strength. 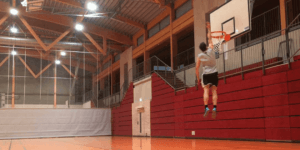 Then, about 10 weeks before you want to max out your vertical jump (the start of the season), you start Vert Shock and stop working out in the Gym. 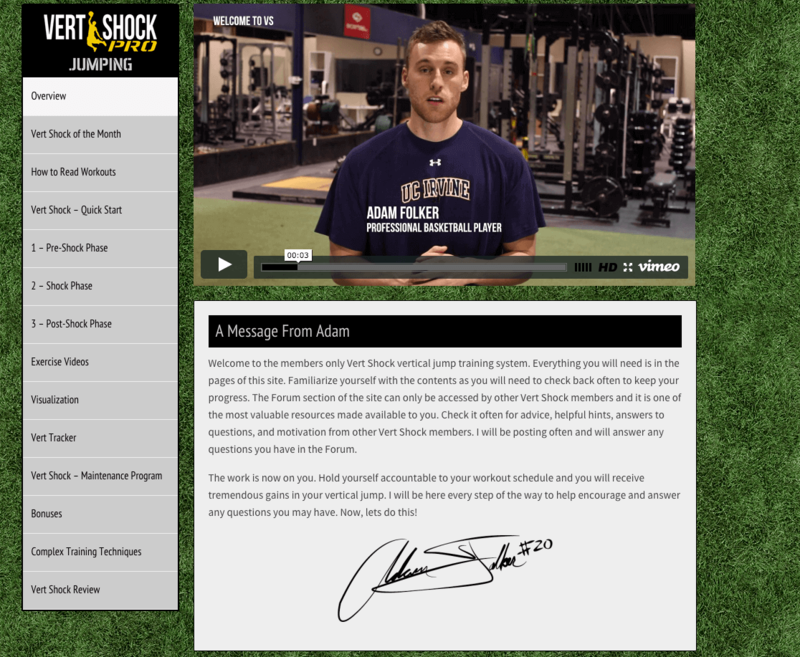 The strength foundation will help you to get even more out of Vert Shock! If you have any questions please post them in the comments. I will answer them as soon as possible! Have you try that Complex training techniques program at Vert Shock? Are those excersies similar to Jump Manual basic excersies? HI Mikko, thanks! No, I haven’t tried the complex training workouts of Vert Shock. I actually totally forgot about them in this comparison 🙁 I will have to add another paragraph! These exercises do feature weightlifting exercises that are similar to Jump Manual. hola andy,felicitaciones por tus comentarios,una pregunta ¿es conveniente durante la realizacion del programa vertical shoock o jump manual jugar baloncesto 3 dias a la semana?lunes miercoles y viernes? I think in both cases I would spread out the training a bit more. For example to the 8 week Vert Shock in 12 weeks instead. You will need some time to rest in order to avoid injuries and overtraining! Hi Andy. I wanted to chip in with my experience as I have used both of these programs in the recent past. I agree with your assessment that VertShock is the ideal option for beginners. The plyo work does a great job of training your muscles and tendons to fire faster and gain explosiveness. That being said, I had a better experience with The Jump Manual, and it is probably because I wasn’t a beginner. As a former college athlete, I’d spent many years working on explosiveness and agility. I had reached a plateau with plyo work, such as VertShock. When I picked up The Jump Manual, I saw about a 7 inch improvement in the first two months after stagnating for years. I think his JA technique in the squats is a pivotal piece of the program. In short, I think both of these programs are useful and even complementary in the long run. There is no reason why you can’t add to the Force and the Speed in your equation to improve your leap. My recommendation would be starting on VertShock and, when you reach a plateau, move over to The Jump Manual and squeeze out another handful of inches. Thanks for having the site put together those shoe reviews. Just checked out a couple and ordered a few pairs of shoes based on the ratings. I’ll report back once I’ve tried them out in the next few weeks. Also, very interested in the Vert Shock program you talk about. I play both basketball and Ultimate Frisbee, and both could benefit from increased quickness and leaping ability. Are you still keeping up with it? Hi Will, great to hear that you like the Shoe reviews, let me know how the shoes work out. Also, if you have any suggestions let me know, I am always trying to improve this part of the site. I haven’t done Vert Shock in a while, but I would really like to get back to it.I really was in the best basketball shape of my life two years ago when I did it. I am sure Vert Shock will help your explosiveness a lot!